Superintendent finalists to be interviewed by the Boone Central School Board this Thursday and Friday are (clockwise from upper left) Nicole Hardwick, Ginger Meyer, Todd Rhodes and Jeffrey Sumy. 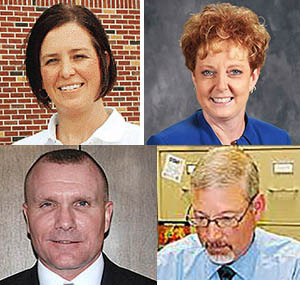 Boone Central School Board selected four finalists for the district’s superintendent position during a special meeting Thursday night, March 23. • Jeffrey Sumy, retired superintendent of public schools in Johnson County, MO. The board reviewed 15 applications for the position with a Nebraska Association of School Boards representative. The board approved a motion naming the four finalists after a closed session. Two special meetings are coming up this week to interview the finalists. On Thursday, March 30, the board will interview Hardwick at 5:20 p.m. and Meyer at 7:20 p.m.
On Friday, March 31, the board will interview Sumy at 5:20 p.m. and Rhodes at 7:20 p.m. Both special meetings will begin at 5 p.m. in the high school library. Sumy served as superintendent of the North Platte, MO, Public Schools, Dearborn, MO, from 2008 to 2015, and served one year, 2015-16, at Crest Ridge Public Schools (Johnson County R-VII District, Centerview, MO. He served previously as a middle school social studies teacher, an elementary physical education teacher, a secondary principal and an athletic director. Rhodes has been superintendent at Maxwell since 2013. Before that, he was principal of North Platte High School for three years, and principal at Adams Middle School, North Platte, for four years. Meyer has been superintendent at Scribner-Snyder Community Schools since 2011. Before that, she was curriculum and assessment director of the 10-school Sandhills Curriculum Consortium, Merna, NE, from 1999 to 2011. She started her career as a teacher and coach at Battle Creek Public Schools (1994-99). Hardwick served as K-12 principal at Loomis Public Schools starting in 2011. She became superintendent there in 2013 and has served in that capacity the past four years. She started her career as an elementary teacher and coach at Norfolk Public Schools.